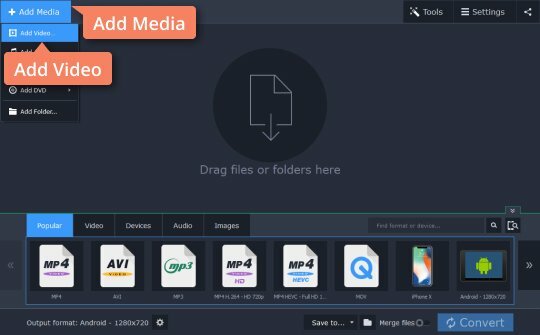 Looking for an MKV converter for your files? The MKV file format has been increasing in popularity ever since high-resolution monitors became widely available, and so there has been a corresponding increase in demand for formats that can retain HD video quality. You can preserve HD quality in your videos by converting them to MKV, which also enables you to choose from multiple audio and subtitle tracks. And that is how the MKV format got its name – it's officially called Matroska Video after the Russian matryoshka dolls because all the video, audio, and subtitle tracks are kept within a single file, much like the nesting dolls are stored within one another. 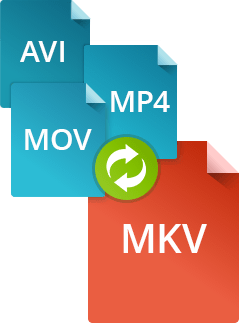 If you want to convert video from your DVDs, Blu-rays, or elsewhere to MKV, your best bet is a simple yet powerful MKV converter like Movavi Video Converter. It’s an all-in-one tool that converts video and audio between more than 180 media formats (AVI, MP4, MOV, MPG, FLV, M2TS, TS, WMV, H.264, DivX, AVCHD; MP3, WAV, FLAC, OGG, and more) and saves them for more than 200 mobile devices, including Apple iPad, iPhone, and iPod, Sony PS4, Xbox One, and various smartphones, tablets, and media players. Use this handy application to trim, resize, and enhance the quality of your clips and movies too. With Movavi Video Converter, you can convert MKV to MOV, MP4 to MKV, AVI to MKV, and other popular formats without losing image quality. Download the free trial or buy the full version of the program and easily convert your videos to MKV and back! In the guide below, we cover how to change video format from MP4 to MKV. You can also use the guide to help you convert any other format to or from MKV. 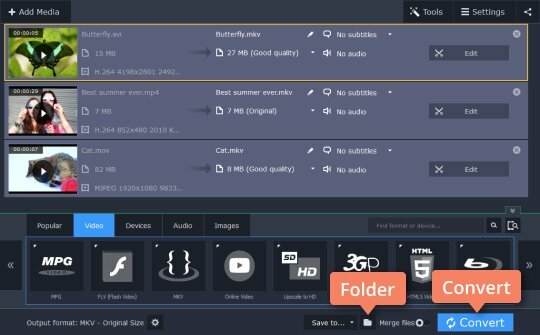 Get the MKV file converter from the Movavi website and install it following the on-screen instructions. This fast and practical software will let you change your video format easily – the interface is so intuitive, you’ll be up and running in minutes. Click Add Media and select Add Video to add videos you want to convert. 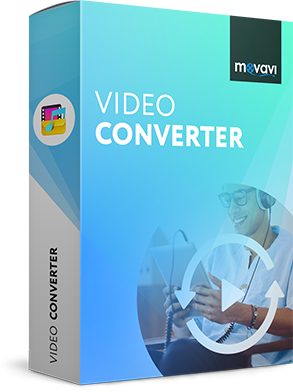 With Movavi Video Converter, you can convert your whole media library, choosing the parameters manually or automatically! Open the Video tab at the bottom of the window and find the MKV category. Expand it and choose one of the MKV presets. If you want to adjust any advanced parameters, access them by clicking the Cogwheel button below the presets panel. If you are converting MKV files to MP4, AVI, 3GP, or any other format, just choose the appropriate preset for your required output format. To choose the folder where you want to place the converted files, click the Folder icon. Now click Convert to process the videos. Converting files can take anything from one to several minutes, depending on the file size and the number of files you‘re converting. Movavi Video Converter creates your new file or files in your chosen format automatically. When the process is complete, a folder with the created files opens automatically.